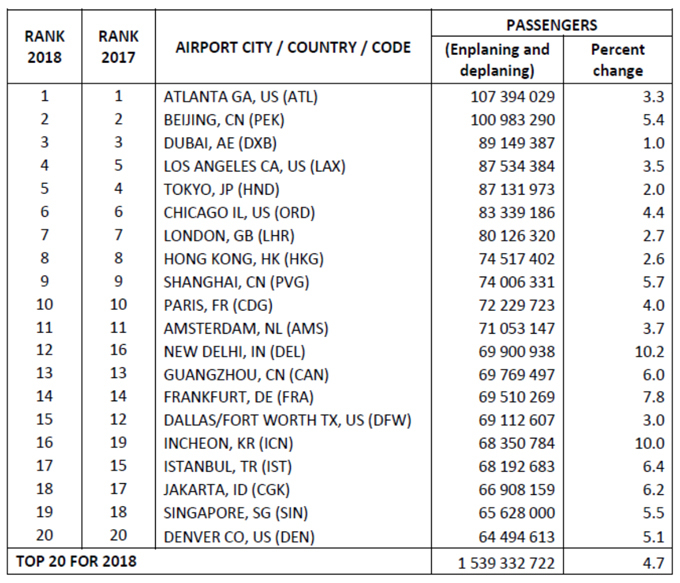 During the the 11th Annual Airport Economics & Finance Conference & Exhibition in London, Airports Council International (ACI) World published its preliminary world airport traffic rankings covering passenger traffic, cargo volumes, and aircraft movements. ACI has found that passenger traffic remained resilient in 2018 and is estimated to have reached 8.8 billion, growing by an estimated 6% as compared to the previous year. This increase is above the 4.3% compound annual growth rate for passenger traffic from 2007 to 2017. The air cargo market did not fare as well as passenger traffic with a year-end growth figure of 3.2%. This is in contrast to a much stronger year of growth in 2017 but comes against a backdrop of global trade tension between the United States and several of its closest trade partners. Atlanta-Hartsfield-Jackson Airport kept the top place and handled over 107 million passengers. Dubai Airport remained in third position as, after years of double-digit percentage traffic growth, it grew by 1%. Hong Kong Airport remains the largest air cargo centre, handling more than 5 million metric tonnes of cargo in 2018 and its volume growing 1.4% against 2017. The top 20 airports for aircraft movements grew by 2.4% in 2018. Chicago Oâ€™Hare Airport has surpassed Atlanta-Hartsfield-Jackson Airport to become the busiest airport in the world for aircraft movements. Both airports experienced slight declines in 2017 but have since recorded growth of 4.2% and 1.8% respectively. "It is heartening to see that global passenger traffic growth has remained resilient in the face of an increasingly tense and challenging geopolitical climate," ACI World Director General Angela Gittens said. "Aviation is strongly linked to the global economy and to local development, however, and the protectionist rhetoric that has swept several Western countries will continue to restrain growth in the efficient flow of people, goods and services. "With the cost of travel decreasing in many markets, and a burgeoning middle class growing in emerging markets, passenger traffic growth has remained irrepressible. Indeed, ACI's global medium-term forecasts reveal growth in demand for air services between 2018 to 2023 will grow by almost 30%. This means many national governments face the predicament of demand outstripping available airport infrastructure." In other significant findings, India became the worldâ€™s third-largest aviation market in terms of passenger throughput, behind the U.S. and China in 2018. India's move towards a more liberalized aviation market and the nation's strengthening economic fundamentals have helped it become one of the fastest-growing markets with its traffic growing rapidly in a relatively short time. Additionally, despite signs of weakness in the cargo market, a number of airports stand out with Doha, Qatar's main hub, continuing to be one of the fastest-growing airports in the world for air cargo throughput and is also among the busiest. It moved from 16th to 11th in the rankings. Copyright 2019 Airports Council International. All rights reserved. From https://airportscouncil.org.